“De Lambikstoempers” one of the best-known and influencial beer-tasting-clubs in Belgium – located in Pajottenland-Zenne vallei (Alsemberg-Beersel) this year celebrates it’s 15 year anniversary. Cuvée Lambikstoemper is an Oude Geuze assembled by Brewery Frank Boon in Lembeek from a recipe by the Lambikstoempers. The blended lambics originate of unique cuts from different “foeders“. The blending took place on March 20 and bottled on March 29 2013. The Geuze refermentated for 6 months in the cellars at Brouwerij Frank Boon and an additional 6 months in the cellars of “De Lambikstoempers” in Alsemberg. The “Cuvée Lambikstoemper” is now ready to be consumed. 2,000 litre were bottled into 2,665 bottles of 75 cl, most of the bottles go to the local members of the beer-tasting-club. 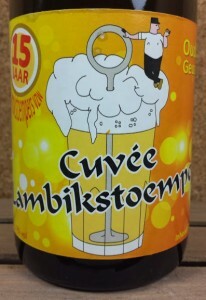 Cuvée Lambikstoemper Oude Geuze 75 cl is sold online – exclusively at Belgiuminabox.com till supply lasts. In collaboration with “VZW Lambikstoempers” this Geuze bottling is sold with a maximum of 6 bottles per person, this to give as many lambic-fans the possibility to taste this unique and fine lambic-ale.